My artistic BFF and I once took part in a Shoe Art Competition at church and designed two pairs of shoes exactly the same (one for her and one for me). The pair of shoes we entered for the competition. Since then, I've always liked painting shoes and told myself that when my girl was older, I was going to buy a pair of white kids shoes and get her to design and paint it herself. I got a pair of white shoes from one of those heartland shops in Toa Payoh for just S$10 and also bought fabric paint from my favourite art store Art Friend. 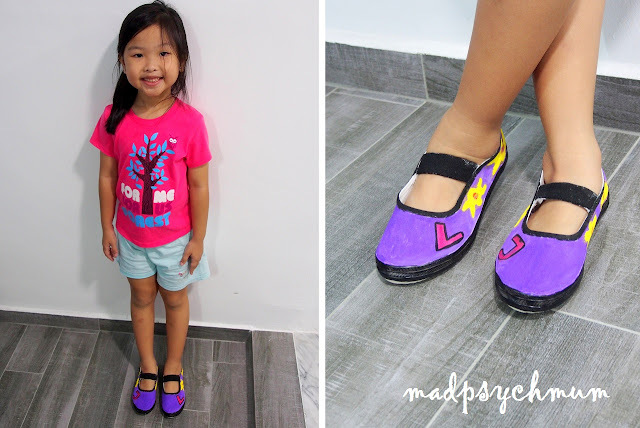 Next, I drew the design on the shoes based on what my girl wanted (she finds it difficult to draw it herself because the surface was not flat; if your child has no issues with that, you can let them draw on it as well). Once that was done, it was time for my girl to paint them! It took her about 2 hours (with breaks in between) but she managed to finish painting them. I did some touch-ups for her after (you know, correct mistakes and all) and viola! Her very own shoes that she designed herself! She was so proud of her shoes that she wears them to school everyday to show off to all her friends and teachers!